How to Blend Western Wedding Ideas in Traditional Indian Wedding Celebrations? Indian weddings as we know depicts a burst of cultures and traditions. Amongst the endless ceremonies, baaratis, band-baaja and the colorful wedding functions that easily last for a week, Couples are looking for ways to make their wedding celebrations a little more novel, a little more fresh and a little more hatke! What better way to do this, than incorporate cool western wedding ideas into your traditional celebration. It’s a trend that’s catching up so why not be on the top of the wedding game and oomph up your shaadi with some of these sweet and spicy western wedding traditions. As much as we’ve grown up watching Bollywood wedding movies, Hollywood is not far behind. Movies like Father of the Bride, Maid of Honor, 27 Dresses and a favourite among the boys - the Hangover movie series, all have inspired us to incorporate some western wedding ideas into traditional Indian weddings. Whether you’re having a fusion wedding or not, this week we bring to you some of the coolest ways in which you can incorporate western wedding ideas, like cake cutting, walking down the aisle and wedding speech into your indian wedding planning and execution. 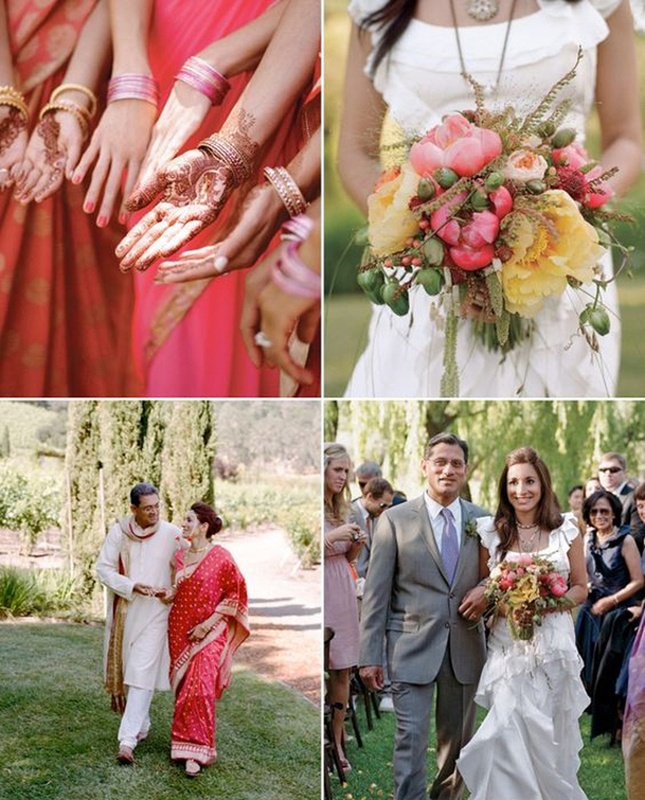 So without further ado, let’s show you how you can incorporate these wedding ideas from the west for your very own traditional Indian wedding. On one of the biggest moments of your life, having your boy and girl gang around is a must-have! They Here are some awesome ways of driving away those pre-wedding jitters by having your bridal party in tow. Have a lookie! The bond between a father and a daughter is as precious as can be. Kanyadan, a ritual practised in Hindu marriages, finds a counterpart in the ritual of the father walking the daughter down the aisle in western wedding ceremonies. Nothing like having the undeniable hero of your life holding your hand and walking you toward the Mandap to give you away to the man of your dreams. It’s just the perfect way to begin your new journey. Bridal showers and Bachelorette and Bachelor parties have stealthily made their way into the Indian wedding tradition, especially in metros and large cities. Another reason to party with your friends and family, these icebreaker events are a great way to calm your nerves and have a great time before the cumbersome wedding rituals and celebrations begin. Plan on having one of these events before your wedding. In fact, maybe one of your friends or siblings may already be doing that for you. So show up, let your hair down and drink those wedding jitters away we say. Nothing like your friends divulging a few embarrassing details of your past or your personality as part of a wedding toast. This may freak you out pretty brides and dapper grooms, given that your chuddy buddies know all your deep dark secrets, but oh what memories they will make,, sometimes teary eyed, sometimes laugh out loud and sometimes laced with nostalgia but all worth the risk we say. The Indian wedding mantras are elaborate and detailed. They are what the scriptures dictate marriage should be. They outline duties and responsibilities the couple now share, as mentioned by ancient practises. Although they are beautiful and bestowed with incredible doses of wisdom and depth, this time is also an opportunity for the bride and groom to express to each other, their truest, deepest feelings and what this union means to them. A concept that is part of western wedding ceremonies, take the time out to write your wedding commandments and incorporate them as part of your reception. It will make for the most beautiful memories, not just for the two of you for but also for your guests. Now we’ve never shied away from naach gaana in Indian weddings. What’s an Indian Wedding without baraatis shaking a leg and the family paltan grooving to the latest bollywood chartbusters on Sangeet night.. In fact Sangeet, originally a pre wedding function that was part of North Indian weddings, has now become part of Indian weddings across the geographical spectrum, thanks to bollywood films like HAHK (Hum Aapke Hain Kaun) and DDLJ (Dilwale Dulhania Le Jayenge). Until some time ago, the bride and groom were just part of the spectator crowd. We must really thank the West for this very romantic concept of the first dance, sneakily making its way in our Sangeet ceremonies. This is when the bride and groom dance to their song - an expression of the love they share for each other and the song that represents their romance in the best way possible. Pretty neat we think! So brides and grooms, get planning, get grooving! No, not the stuffy kind where everyone stares at their plate and quietly eats their food because no one has anything to say to each other.. Sit down dinners or rehearsal dinners as they are called in the west are a significant part of pre wedding celebrations. A wonderful way to mingle with both sides of the clan, cousins and friends in a casual intimate setting - these dinners are a great bonding activity between the two families. Why not introduce this wonderful trend in our great Indian wedding. After all icebreaker activities are an important requirement for our Samdhis and Samdhans (Wink Wink). Jokes aside, this is a great activity for destination weddings where the entire wedding party is mostly together in the same space. Keep sit down dinners small so that people get to know each other. Introduce some wedding favors and small customized gifts suited to the personality of the guest for some fun conversations. Cake cutting is considered to be one of the most essential elements of wedding celebrations in the West. Why so, it’s just a cake and you got to cut it, right? Nope! Got it all wrong there peeps. There’s a deeper symbolism to the cake cutting process. It is considered to be the first task the newly weds perform together as a couple. Remember, how in India the bride has to prepare a first meal in the kitchen of her new home. Well, we like the cake one better! Skip the kitchen and cut the cake we say! Save the date is the most convenient way to announce your wedding day considering the length of the guest-lists we have. It takes a village to plan a wedding and a village to make a party, right? Save the date is a the best way to give your guests a buffer to start preparations for your special day. After all, we all need to look and feel the best on our loved ones special day, right? We all modestly tell our guests ‘no gifts please’, but we all secretly wish to receive something on our wedding day, don’t we? The West seem to have found the most sophisticated way to ask for gifts too. They are fast, aren’t they! The wedding registry is where you put out a list of things you would want to have as your wedding gifts and let your guests pick out things from your wish list based on the budgets they have. Great way to make sure you’re getting what you really want - unless it is envelopes stuffed with wads of cash that suit your fancy!! Goodearth helps you to easily create, find and manage your bridal registry. Check it out! Let’s admit it, Indian weddings can get boring, especially because some of the rituals are so long drawn and cumbersome.. Out of all the guests, the ones who to begin to get the crankiest are kids attending the wedding. Involving them in your celebration by tasking them to become flower girls who lay flowers on the aisle before you make your grand entry or having the little boys hold cute little placards that announce to your guests and let the groom know you’re about to arrive, can be the sweetest, most awe worthy element of your celebration. What’s not to like about the little munchkins in lehengas and kurta pyjamas, having fun and getting involved. These were some of the western wedding ideas we’ve witnessed on Indian wedding scenes, if you’ve come across any more interesting one, share it with us on content@weddingz.in.